A combined inhaler containing two different medicines can be a more effective treatment than the current options offered as standard, according to new research. Asthma patients are typically given two separate inhalers under current guidance, one being used as a preventative measure and the other used as a treatment during an attack. 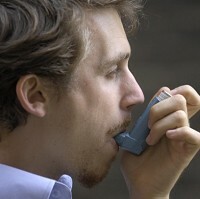 The latest research, reported in the in the Lancet Respiratory Medicine journal, concludes that the combined inhaler reduced severe episodes by a third and was safe to use. Holders of asthma travel insurance policies may be interested to note the new evidence and await the response of the wider medical community to the findings. Scientists carried out the 12-month trial in 14 European countries and noted that patients with the combined inhaler went on average 209 days before their first attack, whereas those with two separate inhalers were symptom-free for 134 days. Those on the combined treatment also showed a reduced risk of hospitalisation, according to the findings. A second study in the same journal found that patients' intake of corticosteroids was not increased through use of the combination inhaler. The researchers said that although the combination group did have a bigger daily dose, their lower risk of asthma attacks meant they were less likely to overuse the medication.